Koosah Falls is the second of the three major waterfalls of the McKenzie River and is just one mile downstream from Sahalie Falls. The word Koosah is a Chinook word meaning “sky”. 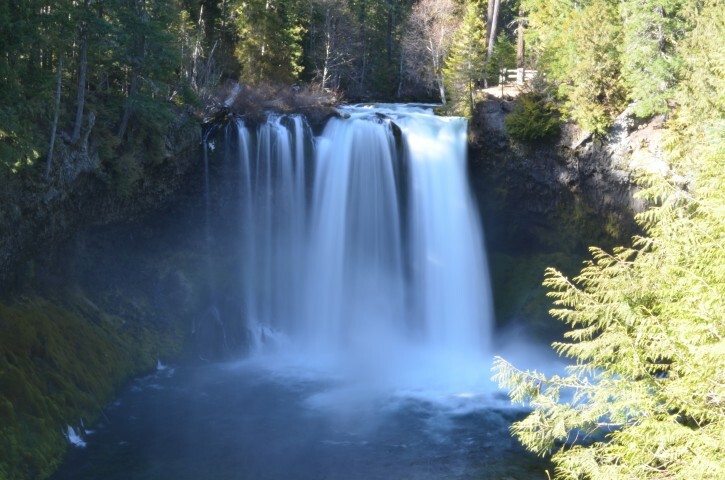 These falls were formed 3,000 years ago when lava flows formed the McKenzie River. The volume of the river greatly changes the appearance of the falls. During modest summer river flows, the falls appear as one or two segments, but during the peak of snowmelt, the river spreads across the whole ledge, becoming a 70 foot wide wall of ear-splitting roar. You can Chase Waterfalls with us by subscribing to this blog, follow us on Pinterest, and on our Facebook Page. According to Wiki there are at least 238 waterfalls in Oregon! I’m guessing even more than that. Wouldn’t it be grand to witness the beauty of every one of them? With 77 waterfalls on the Oregon side of the Columbia River Gorge alone, we’ve set out to find them all plus those in the nearby Mt Hood National Forest, Washington and beyond. And when we do we’ll share our finds with you, our guests, so you too can set out to Chase Waterfalls. The McKenzie River Round House is an Oregon Bed and Breakfast Guild member inn that can serve as your home base while chasing the waterfalls along the McKenzie River.